I just bought the QSC K12 speakers and were very impressed with the quality of sound. I used to used the Mackie SRM450 and now I switched because I was having issues with the Mackies. The QSC sounds crisp and very clear. The bass is impressive and loud for a compact speaker. It is slightly smaller than the SRM450 but very powerful. Don’t get me wrong the SRM450 are very good and I used them for over three years and I definitely got my money’s worth. The QSC has a built in fan that cools the speaker and keeps it from overheating. It has multiple outputs in the back panel that also allows you to hook up RCA cables to it. This is very convenient for wedding reception’s cocktail hour for hooking up a laptop to it or an Ipod. So far, I would recommend the QSC K12 speakers. I think it is worth the extra money and they look great. 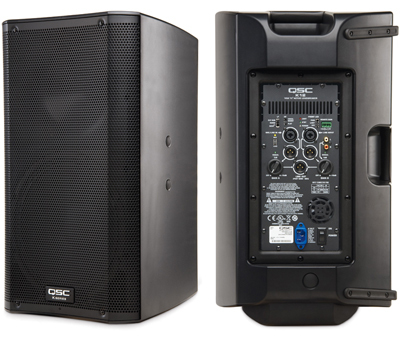 Your post, Review of the QSC K12 PA Speakers ‹‹ Stukwan Entertainment, is really well written and insightful. Glad I found your website, warm regards from Frances! Thanks frances for the support. I’ll try to keep up good insightful material. Like us on Facebook. I just want to mention I am just newbie to blogs and actually loved your web-site. More than likely I’m planning to bookmark your blog . You certainly have terrific articles and reviews. Bless you for sharing with us your web site. I do agree with every one of the ideas you have offered inside your post. They can be seriously convincing and will undoubtedly work. Even now, the posts are quite quick for novices. Could you satisfy extend them a bit from upcoming time? Thanks for the article. Great article. I understand anything extra difficult on completely different blogs day-to-day. It’s likely to in the least situations be stimulating to go through written content content from other writers and observe a little one thing from their retailer. I’d want to make use of some with all the articles content on my weblog whether you don’t head. Natually I’ll offer you with a hyperlink on your own word wide web blog site. Thanks for sharing.